Change is the addition, modification or removal of anything that could have an effect on IT services. Changes are introduced to realize benefits and reduce service disruptions, defects, and rework. 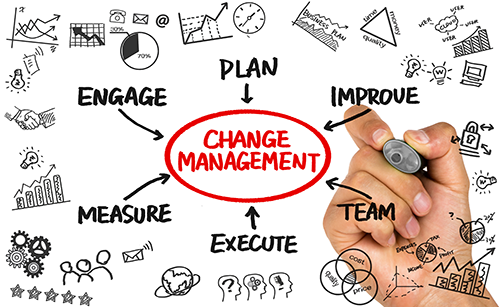 The purpose of Change Management is to control (but not become bureaucratic) all the changes so we can protect the business, the continuity of our services and optimize risk. The establishment of the Change Management process necessitated the development of the governance structure to ensure that appropriate levels of authority are engaged in approving proposed changes. The Change Advisory Board was founded on August 12, 2015. The CAB's Terms of Reference reflect its mandate, scope and modus operandi. CAB is scheduled to meet each Wednesday at 10:00 a.m. as required to address proposed or open change requests. Meetings are available to Sheridan employees, scheduled for one hour and conducted via WebEx. August 9, 2017, Meeting cancelled. The membership of the CAB is flexible, depending on the change(s) being reviewed, to ensure that there is proper representation of the appropriate technical and business interests. In addition to the standing members referenced below, change originators, service owners and/or the business owners affected by a proposed change are invited to attend CAB. Cherwell is the software tool used by Sheridan for IT Service Management (ITSM). The CAB utilizes Cherwell to manage change requests. The video linked below requires the WebEx Network Recording Player for Advanced Recording Format (.arf) files to view. This version, and other WebEx players, can be downloaded from sheridancollege.webex.com. Select Support > Downloads and follow the link under Recorder and Players.